B & H Engineering, P.C. has provided construction support services to the New York City Department of Transportation for the Rehabilitation of Ninth Avenue Bridge. The project included rehabilitation of two structures over the Transit Authority property, the first spanning 38 Street Yard and second spanning the Ninth Avenue station. Both are five-span structures. The northern structure spans four railroad tracks inside the Transit Authority Yard, consists of concrete-encased steel beam between two abutments and four piers. The southern structure spans three railroad tracks and two stations platforms. The construction support services included review of shop, erection, electrical drawings including catalog cuts, approach deck and slab reinforcement, contractor's proposed loading, protective shielding and temporary structures, survey data, field changes and modifications, concrete haunch tables; the investigation, analysis and preparation of responses to unanticipated field conditions; the clarification and furnishing of design intent of plan, specifications, and estimate; and the performance of interim inspections. This project included removal and replacement of the entire northern structure, and rehabilitation of the southern structure. 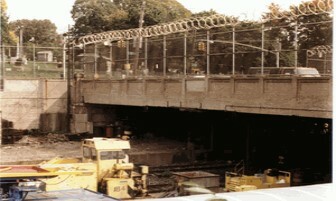 The work consisted of installation of new abutments, piles, retaining walls, concrete footings, steel column bents, new superstructure (steel stringers and concrete deck), new safety barriers, sign structures, drainage and lighting system; replacement of sidewalk support steel and deck; coordination with Transit Authority; and the in-depth inspection the remaining structure.